Getting the most out of your instrument investment is key. 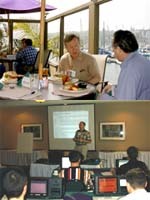 We offer operational "hands-on" training seminars in the use of our analyzer systems. These seminars are taught by experienced analyzer experts, and are as useful to the seasoned pro, as they are to the novice technician. All system features and benefits, as well as professional operating tips are covered in thorough detail. We also provide customized on-site training to help your technical staff obtain the maximum benefit from your instrument. Basics of dynamic signals produced by vibration, sound, pressure, electrical signals, etc. Setup and operation of specialized measurements and optional measurements including synchronous time average, impact response, data preparation for modal/structural/acoustic visualization programs, octave analysis, and more. Coverage of special topics such as microphone functions, piezoelectric transducer functions, and other sensors as they relate to use with a dynamic analyzer. Call us today for information on upcoming seminars.